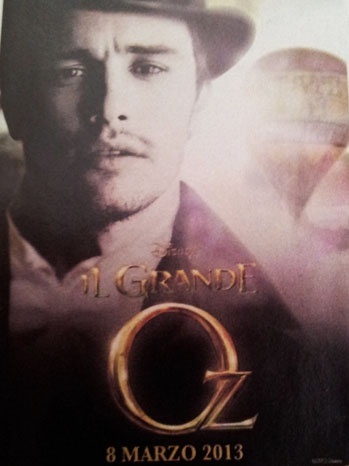 Marketing for Sam Raimi’s Oz: The Great and Powerful has begun in Italy with a poster showcasing star James Franco as the Wizard. What’s that? You’re not sure what the premise is? The movie is a prequel to The Wizard of Oz, following the Wizard, who, at the time, was merely known as an illusionist. Forced to run from the circus in a hot air balloon and — as you guessed it — is swallowed by a tornado and sent to Oz. Once there, he encounters witches who possess real magic. Mila Kunis and Rachel Weisz join as Theodorah and Evanora. Oz: The Great and Powerful comes out in theaters March 8, 2013.